My baby has a new favorite activity. She loves looking in the mirror and staring at her own reflection. It took a few moments with a baby mirror in front of her face for my daughter to start reaching for the reflective surface. 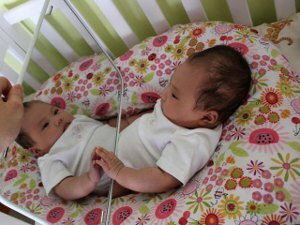 Now, she loves touching the bottom part of the mirror as if she is holding hands with her own reflection. Letting my baby look in the mirror is fun for both of us. She obviously enjoys interacting with herself and I get to see her smile. The baby mirror I purchased for her crib come with velcro attachments designed to be hooked onto the top railing. Since my daughter only likes being in her crib if she can sit on her boppy pillow, the naturally flat angle created by the mirror doesn’t allow her to see her own reflection. So to allow my baby to look at herself in the mirror I have to physically hold the mirror. In addition, since her eyesight is still developing, she prefers to have the mirror within one foot of her face. She is now too long for a mirror at the foot or her crib to entertain her, so daddy has to balance the baby mirror on top of the pillow to allow my two-month old baby to play. Although my baby and I treat mirror play as just another fun activity, academic research has shown that a baby’s response to their own reflection in the mirror is a tool for tracking proper development. Psychologists use a term called the “mirror test” to test self-awareness through use of a mirror. In the case of humans, babies are expected to have self-awareness by 18 months of age. Children who do not change their behavior in front of the mirror by the time the turn 2 years old may have developmental disorders. My baby girl is only two-months old so she is far too young to exhibit any self-awareness. For now, she is enthralled with staring into the mirror and trying to touch the cute baby she sees. Watching as my baby is looking in the mirror has been a fun experience for me as well. Rather than entertain her the colorful books or contrasting patterns we have scattered around our apartment, my wife and I have been propping the baby mirror in front of our daughter. Since our baby discovered she could touch the mirror it has become her favorite toy.